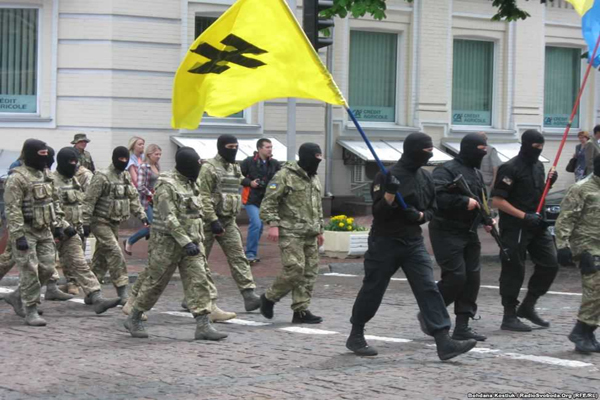 An amendment to the 2015 National Defense Authorization Act (NDAA) that would have forbidden US assistance, training and weapons to neo-Nazis and other extremists in Ukraine was kept out of the final bill by the Republican-led House Rules Committee. Introduced by Democratic Representative John Conyers, the amendment was intended to help tamp down on violent confrontations between Ukrainian forces and Russian separatists. (Full text of the amendment embedded at the end of this article).A USA Today/Pew poll conducted in April while the NDAA was being debated found that Americans opposed by more than 2 to 1 providing the Ukrainian government with arms or other forms of military assistance. The ADL’s Washington office and the Simon Wiesenthal Center did not respond to numerous requests by email and telephone for comment.Earlier this year, the ADL’s outgoing National Director Abraham Foxman noted Svoboda’s “history of anti-Semitism and platform of ethnic nationalism” in a press releasedemanding the party renounce its past glorification of Stepan Bandera, a World War Two-era Nazi collaborator who has become a symbol of Ukrainian nationalism. Right Sector, the radical right-wing movement that battled riot police during the latter stages of the Euromaidan uprising, earned plaudits from the ADL’s Foxman when its leader arranged his own meeting with Din El. “[Right Sector leader] Dmitry Yarosh stressed that Right Sector will oppose all [racist] phenomena, especially anti-Semitism, with all legitimate means,” the Israeli embassy declared.